11.28.17: Mountain Mods Website Update! Mountain Mods has migrated servers and implemented a website update. A more modern and fresh look has been implemented. Newer versions of PHP and server software have been implemented. All accounts are still active with order history etc. Some website experiences, such as CYO flash picker are still being worked on. Please let us know if you experience any issues. 03.16.16: Mountain Mods Polished Acrylic Assembly Blocks - Available NOW!! With the release of the Polished Acrylic Assembly Cubes - All Mountain Mods Acrylic Cases are BACK IN STOCK!! Also, Keep checking back here as we will be releasing several more great Acrylic Case variants - SOON!! 12.21.15: Mountain Mods is pleased to announce another great DIY item to our list of great items. Mountain Mods ITX Modular I/O Panels are available for purchase NOW. We had many requests for something even smaller than our mATX I/O panels and we have followed through with the same great quality I/O panels that you are used to seeing from Mountain Mods. 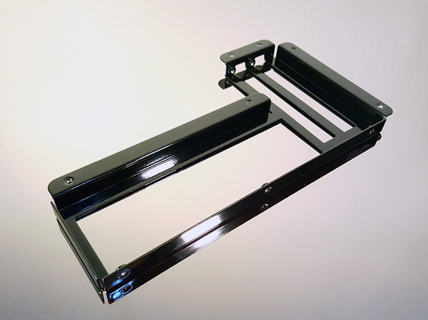 03.28.15: Mountain Mods 140mm HDD Brackets Released! Mountain Mods 120mm HDD brackets have been used in thousands of builds since their inception. Now those using primarily 140mm fan system builds have an option. The Mountain Mods 140mm HDD bracket! Mount up to 4 x 3.5 inch hard drives per bracket set. 04.12.14: Mountain Mods Gold Digger and 20 PCI I/O brackets released! 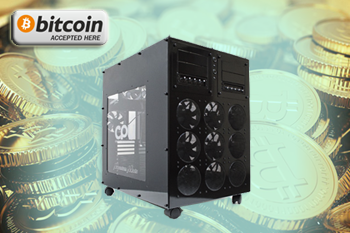 Mountain Mods Gold Digger cases are manufactured specifically for GPU mining of crypto-currencies, GPU Folding, and any need for multiple GPUs operating at near 100% Load nearly 100% of the time. Mountain Mods Gold Digger series cases utilize the base US patented U2-UFO and Ascension designs and incorporate a whopping 20 PCI I/O bracket. The 20 PCI I/O bracket attaches to the Gold Digger case back panel. The bracket utilizes Mountain Mods patent pending Air Assist feature. The I/O Air Assist is achieved by insetting I/O Mounting holes away from the case with enough space to mount 3x120mm fans behind the bracket and internal the case back panel. 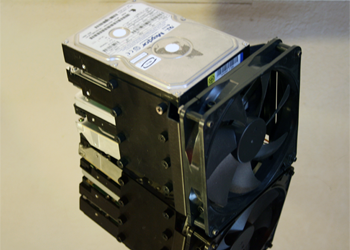 The use of 120mm fans greatly increases airflow in the GPU as well as between GPU�s. The result is a drastically cooler running GPU with overall lower GPU fan speeds. The reduction of thermal load on the GPU as well as the reduction of the GPU fan speed operation increases the longevity and performance stability of the GPU. Riser cables are used to extend the GPU�s from the Motherboard below. Operating the GPU's several inches off the motherboard results in little to no heat transference from the GPU to the motherboard itself. This also greatly reduces thermal loads on the GPU's as well as the motherboard and components. Mountain Mods Gold Digger cases also incorporate a separate I/O panel that attaches to the motherboard allowing for the use of other PCI � I/O devices, including full size GPU\�s on the mainboard if desired. The 20 PCI I/O Bracket is also sold separately for the DIY person looking to mount multiple GPU\�s to existing or homemade platforms! The U2-UFO and Ascension Gold Digger Back Panels can be purchased separately as well - just select GOLD DIGGER from back panel type optoin. Mountain Mods is pleased to announce acceptance of the Digital Currency Bitcoin (BTC). To Purchase with Bitcoins, choose the Bitcoin Currency at the top of the page. Then during checkout, select Bitcoin (BTC) as your payment option. On the confirmation page a total is given in BTC as well as the Bitcoin address to send to. Just load your BTC wallet and send the exact amount to our BTC receiving address. Funds will be verified as received in 1 business day and your order processed. THANK YOU - To the MOON! 09.19.13: Mountain Mods 2 PCI-IO brackets released! Mountain Mods 2 x PCI brackets allow for an inexpensive and easy way to integrate more PCI/IO devices into your existing chassis or to integrate into your own DIY homegrown chassis. 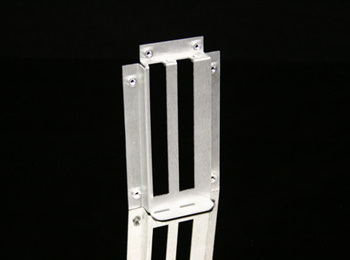 These brackets are fabricated from high quality 1.65mm thick Aluminum sheet metal and formed with precision tools. Top notch 6-32 Aluminum threaded inserts are hydraulically pressed into the mounting flange of each side bracket for panel attachment. Just cut out a hole in your chassis to the specification and the 6 screw mounting clearance holes. Assemble your devices between the brackets, align the assembly with your cutouts and use 4 x 6-32 threaded screws to firmly mount to the panel. These are a great way to install PCIE video cards on Riser boards. 06.01.13: Mountain Mods - Decadent Decade! 10 years ago today, Mountain Mods unveiled itself to the world. At that time Mountain Mods brought forth the first evolution of the award winning chassis, known as the U2-UFO. Little was it known that the U2-UFO would revolutionize the world of computer cases, but that is indeed what transpired. The U2-UFO was big, bold, and Borglike. From its first revelation to its current form, the U2-UFO and all of its evolutions have turned the heads of many astonished onlookers. 10 Years ago there was nothing remotely like it in the commercial environment. 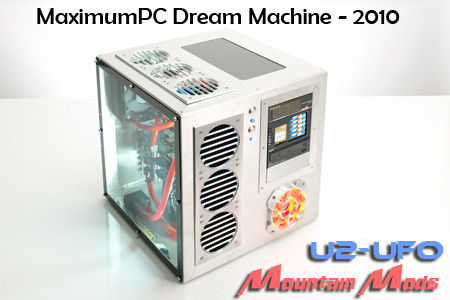 Like the U2-UFO, Mountain Mods itself was forging a new market, the market of Custom Computer Case manufacturing direct to the customer. From the single configuration of the first run of U2-UFO units sprouted minor adaptations. The old original U-Wrap exterior shell with original top option gave birth to the Big Window and Solid top models. Then the single U-Wrap dropped in favor of three individual panels that you see today. Then Mountain Mods did another first to market with the explosion of the main chassis into its Trade Dress �Hyper Modular� design of today. The �Hyper Modular� design collapsed the box into completely separate pieces that could be flat packed and shipped for much less around the globe. The separate piece design also allowed for an easy way to change out a part for an entirely different configuration/case. Or you could rotate a panel 90 or 180 degrees for an entirely different setup. With a vertically oriented motherboard configuration you could just rotate the back panel, put in a horizontal brace, and presto, your computer case has transformed into a new configuration. This evolution accompanied with the introduction of a variety of different panels took the single U2-UFO and gave it over a mind-boggling 36,000 configurations! 10 years later and Mountain Mods has developed several lines of �Hyper Modular� cases as well as the small H2gO aluminum case and several Acrylic cases such as the Bob Slay and a plethora of other computer case parts and accessories. 10 Years is a huge accomplishment and we�d like to extend our thanks. Thank you to all Mountain Mods employees throughout the years. Thank you to all of our business and operational partners. Most of all THANK YOU, our customers who have helped fund the evolution with your purchases and your feedback. Celebrate with us, and own a piece of computer case history. Mountain Mods is extending a 10% off base price on all CYO computer cases and several price slashing promotions on other parts for the entire month of June! THANK YOU! (The CYO � flash picker will not indicate this price break, but can be viewed in the shopping cart and during checkout). 04.24.13: Mountain Mods 2x5.25 brackets released! For Ascensions and Extended Ascensions � Duality 10PCI: This panel integrates two cutouts for 10PCI motherboard trays. This can be used with dual XL-ATX or HPTX or mix-match of either tray. Many users have been purchasing these via email/phone request for over a year. Now you can purchase them online individually or with a new case. 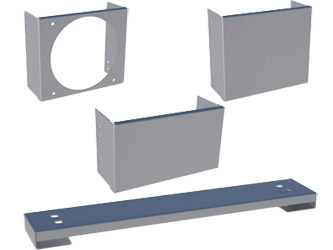 For Pinnacle 18/24 � 10PCI � 2PSU: This panel loses a 120mm outlet fan in lieu of an additional PSU support. This panel has been around for a while and is now officially available to Purchase with a case or individually online. 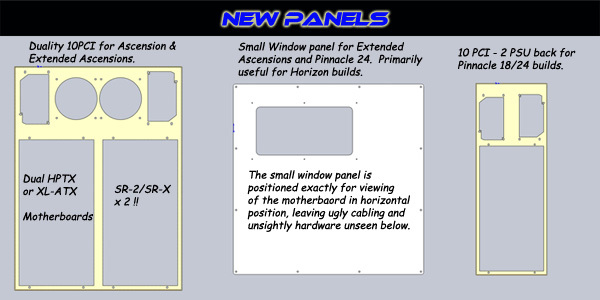 For Extended Ascensions and Pinnacle 24 � Small Window Side panels: This panel is primarily for Extended Ascension builds in horizontal configuration. This panel has a much smaller window than the big window and is oriented Exactly to view the motherboard tray only in the horizontal mode. The large Panel portion below hides all unsightly cables and other hardware you�d rather Not see. All the above panels are available online in the HTML driven pages � not yet integrated into the CYO flash picker. If purchasing a case you can use the flash picker � add item to the cart then from the cart click the item and edit the panel in the HTML driven page or just order entirely from the HTML driven page. 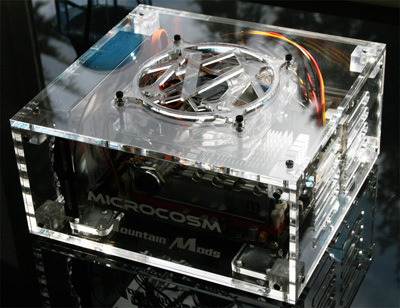 04.14.12: Mountain Mods mITX Acrylic Computer Case - Microcosm released! Enter Mountain Mods first mITX computer case the Microcosm. The Microcosm is made from American high grade quarter inch thick cast acrylic. This version of the Microcosm fits mITX boards with external power blocks only. No space is available for internal power supplies. The dimensions are 9.5 inches wide, 8.3 inches deep, and just 4.5 inches tall (4.75 inches tall with attached acrylic feet). The Microcosm also has space for one 3.5 inch hard drive. With the terabyte hard drives of today this makes the Microcosm a very small, compact, low powered and adequate HTPC or file server option. 08.21.11: 10 PCI - 2 PSU back panel released! The New 10PCI-2PSU back panel incorporates a second PSU port on the 10PCI back panel for the hungriest of power builds in the U2-UFO and Extended U2-UFO chassis. The Panel can be purchased separately or with new cases. 04.03.11: New 5.25 bay covers and Low Ride Ascension Horizontal braces released! 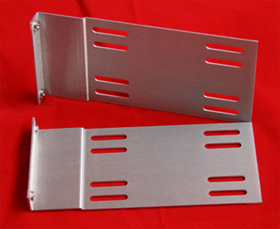 - Mountain Mods now has dual, triple, and triple 120mm all aluminum bay covers for sale. Also released - a new horizontal brace for those who want the motherboard tray horizontal while close to the floor level of the case. 07.27.10: Mountain Mods U2-UFO chosen as MaximumPC 2010 Dream Machine. Mountain Mods is extremely grateful to have the Mountain Mods U2-UFO chassis selected to house the 2010 - Maximum PC Dream Machine. � �Gigantic and fully customizable, this is the ideal container for a Dream Machine�. In honor of the award we will be selling the Maximum PC Dream Machine configuration at a discounted price � HERE. Click the pic for a full front page shot of the Maximum PC. 05.20.10: EVGA SR-2 fits like a glove on Mountain Mods HPTX - Modular Motherboard tray. 12.08.09: Pickin and Grinnin - Since our conception Mountain Mods has drastically changed the field of computer housings with a completely Unique and Exclusive chassis � the Mountain Mods U2-UFO. From that point of origin like the U2-UFO itself we have evolved. 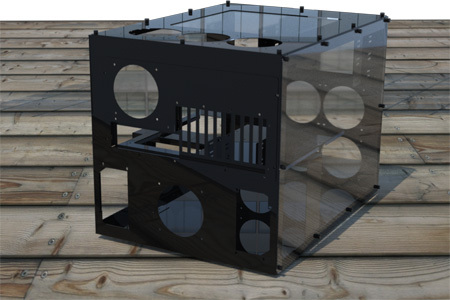 The evolution spawned our most recent designs utilizing the patent pending �Hyper Modular� design. The �Hyper Modular� design is once again a FIRST and completely EXCLUSIVE feature of Mountain Mod casings. It allows for several thousands of possible configurations on several case designs. 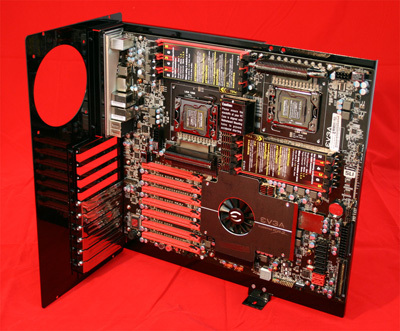 The �Hyper Modular� design also allows the user to easily change his/her existing configuration and as many users are discovering with the recent addition of the 10 PCI (XL-ATX) motherboard tray and back panels; it allows for a quick, easy, and an inexpensive way to always upgrade to the latest and greatest in computer hardware without having to purchase an entirely new chassis. AND NOW with the advent the CYO Flash-Picker Interface we are revolutionizing yet another aspect of the PC computer case � the way in which you order it. Mountain Mods CYO Flash-Picker Interface is an awesome new way to order a computer case. The Flash allows you to select your individual panels and see your case in assembled form prior to buying it. Other things integrated into the picker � Turn off layers to view only certain parts of the case or for better internal viewing; select your acrylic colors on the fly and see what they might look like; get a running total based upon selections currently selected; print the image to a printer; and of course place an order � pushing the data to your shopping cart. 10.29.09: Mountain Mods releases two NEW acrylic cases. - Say hello to the Mountain Mods - Bob Slay V2 and Transparency. The V2 is a bigger version of the original Bob Slay allowing for use of larger video cards and easier water cooling while remaining compact. The Transparency offers a great option for your Home Theater setups. 07.23.09: The Crystal Ships have landed! - The Crystal Ship incorporates the lightweight yet extremely durable Ascension/UFO Hyper Modular Frame with beautiful laser cut acrylic. The Acrylic is 1/4 inch thick cast. The back panel, motherboard tray, bottom panel, struts and 5.25 bays are all constructed from high grade aluminum and powder coated mirror black. The contrast of the 1/4 inch thick acrylic on the mirror black frame is stunning! The Hybrid combination gives you the best of both worlds; an extremely sturdy frame with the full viewing capability of an all acrylic case. It also makes this 1/2 the weight of an all acrylic case of the same size. 07.23.09: 140.3 radiator and 10 PCI slot panels released! - Available now with Ascension and Extended Ascension CYO cases! 140.3 front panel incorporates 140mm fan holes for Hardware Labs and Thermochill triple 140mm radiators. If that is not enough you also have space for a 140.2 underneath the drive bays. 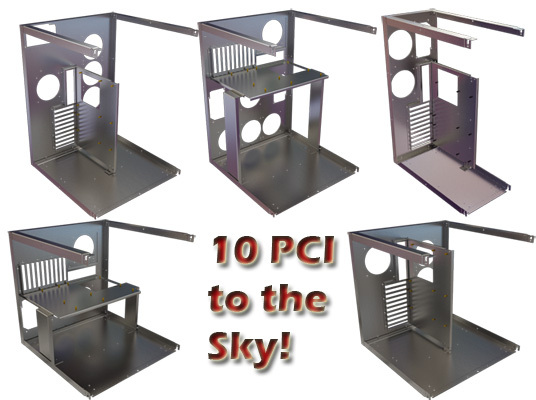 Also available now - 10 PCI back panel. When ordering this panel with a case you will receive a 10 slot PCI motherboard tray (available only in ATX). 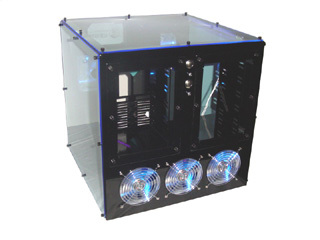 All of these panels can be purchased separately in the case parts section. 11.08.08: Mountain Mods steps into the world of tower case construction with the Pinnacle series. Two great chassis with plenty of open space for water cooling applications without modifications. With the Pinnacle 24 one can fit a QUAD radiator on top while getting a TRIPLE radiator on the front without modifications. The Pinnacle 18 allows for up to 2 TRIPLE radiators. 09.20.08: Extended Ascensions and Extended U2-UFO Choose Your Own style! The extended series increases the depth of the existing platforms to 24 inches! This greatly increases floor space. The additional space will also simplify the most beastly of EATX system builds. 09.19.08: PEDESTAL and PEDESTAL 24 (extended version) - The Mountain Mods Pedestal acts as a separate chamber underneath your existing U2-UFO or Ascension. This under chamber will come with a variety of options for radiator mounting and additional 5.25 bays. 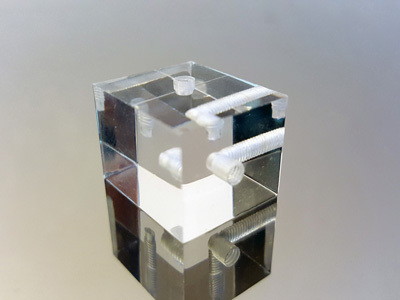 This chamber is a perfect way to isolate the water cooling components from your valuable hardware or a great and easy way to introduce a phase changing solution into your cooling. The Pedestal can be stacked in multiples or the individual struts will allow you to use with U2-UFO or Ascensions for multiple stacking of U2-UFOs or Ascensions. Build your own tower of Babylon! 09.06.08: Quad radiator panels released! - Mountain Mods is releasing 3 new panels for the Ascension (and coming soon) Extension and Extended/Ascension series of cases. The side panel - Triple Quad allows for the mounting of up to 3 Quad radiators where space allows. The Front Panel - 720 Quad allows for the mounting of a single Quad radiator and two triple radiators. The Back Panel - Quad takes the standard back and loses a PSU port in favor of a Quad radiator mounting. All Quad mounts are applicable with Hardware Labs and Feser Quad radiators. The 720 Quad front has Swiftech/Hardware Labs spacing for the two triple rads. All of these panels are currently available for pre-order and should arrive in late September. Also note that all andozided Ascension cases are out of stock and a pre-order only. Some other Ascension parts are currently out of stock. Be sure to email or call in to inquire about existing stock prior to order. All pre-order parts are due late september. 04.06.08: ASCENSION! - It is time. 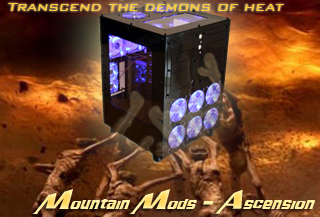 Mountain Mods officially releases the "ASCENSION" series of cases. The Mountain Mods Ascension adds 6 inches of height to the already massive U2-UFO platform. The behemoth stands 24 inches tall and is 18 inches deep and wide. The Ascension like the U2-UFO is COMPLETELY MODULAR - or 'HYPER MODULAR' as we call it. The front and back panels can rotate 180 degrees for a different configuration. 02.10.08: CHOOSE YOUR OWN ADVENTURE! - Search for paradise Inside a U2-UFO. Before you lies a large selection of various panels. Choose from four different fronts, three different backs and seven different side panels for each three sides. You can choose from a variety of finishes, acrylic color and fan hole spacings. Choose to further customize your cube with window etchings. A plethora of choices lay ahead of you. Make the choices that best suit your individual needs. In this adventure there is no wrong choice, only right ones. Each choice will result in a beautiful TRUE Cubical Computer Case housing your precious hardware while keeping it as cool as it looks. The choice is YOURS and so is the case. Mountain Mods U2-UFO CYO! 11.20.07: HYPER MODULARITY ARRIVES! - Twelve previous evolutions have occurred to the Mountain Mods U2-UFO. Number 13 takes the already modular cube computer case into an overdrive of options. The new patent pending functions have been named 'Hyper Modular'. 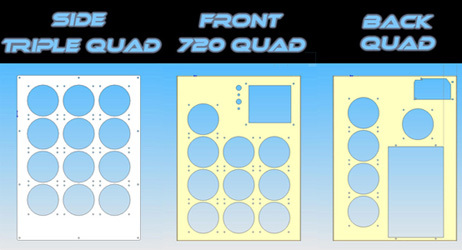 For nearly 3 years the right, left, and top panels have been modular, allowing for swapping or rotations of the panels to give the user a further customized cube. The �Hyper Modular� evolution now includes these features to the front and back plane of the case. You can rotate your front panel 180 degrees. The back panel can rotate 90,180, or 270 degrees for different configurations. You can also mix and match your desired front panel with the desired back panel. Or purchase different front and/or back panels in the future to change your cube configuration without needing to purchase an entire case. The �Hyper Modular� design is truly a revolution in computer case design. All U2-UFO designs are shipping modular now. CLICK THE PIC for assembly instructions. 08.01.07: MOUNTAIN MODS H2gO UNVEILED - "The H2gO was designed for the enthusiast on the go. Measuring up to 17 inches deep, 13.5 inches tall and 12.75 inches wide, makes this case highly portable without sacrificing in the cooling or technology departments. The case is like all Mountain Mod cases broken into 2 separate chambers. The Top chamber houses a full ATX (or smaller mATX) motherboard and no other heated components. This allows for an awesome view through the top and side window of the case. The 2 x 120mm intake fans blow in symmetry with the back 2 x120mm fans for full AIR chamber effect. If air just is not enough for you then purchase a Thermochill PA 120.2 and attach it internally on the front of the unit (other manufacturer radiators can work as well by attaching one fan to chassis only and the other to radiator then chassis). If one Thermochill PA 120.2 is not enough purchase yet another and attach it to the back of the unit, externally and route your tubes through the lasered out holes in the chassis for up to 7/8 inch OD tubing. Still if that is not enough 2 more 120mm blow holes exist on the bottom chamber and are quite capable of holding a Thermochill PA 120.1 or any other single radiator.."
08.23.06: MOUNTAIN MODS RELEASES THE HORIZON! - The Horizon series of the U2-UFO offers the same great features at a new angle. Like the Opti-1203 series the front panel integrates 2 x 5.25 removable drive bays and 3 x 120mm horizontally positioned intake fans that align with Thermochill radiators. On the back panel we rotate things 90 degrees giving you a fully open view of the motherboard at the top. This horizontal position is great option for some of the larger Heat Sink Fans out today or for a different view of watercooling components. All drives are on the lower chamber of the case. As with all U2-UFO cases you get 2 Power Supply ports to meet your power needs. 08.13.06: MOUNTAIN MODS U2-UFO IN SKY WHITE POWDER COAT! - Red and grey and black and white and you decide which is right and which is the solution! The ever evolving U2-UFO is now available in white with a multitude of panel options. 2.01.06: Mountain Mods receives a patent from the United States Patent and Trademark office covering the U2-UFO and Twice7 Computer cases. 1.25.06: Mountain Mods Twice7 makes an appearance at CES! 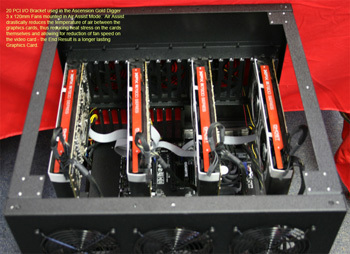 - Mountain Mods sponsored Chris Ram of The Adrenaline Vault gaming review site with the Twice7. 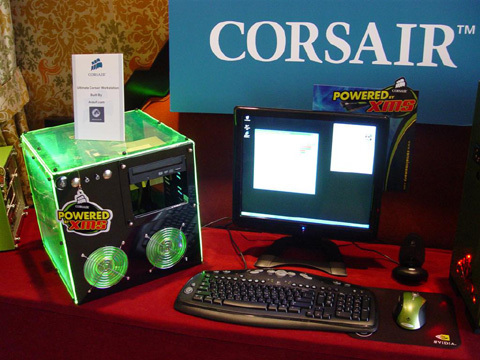 Chris made arrangements with Corsair to display the case, holding a Quad Opteron system utilizing Corsair Ram, in their booth. The U2-UFO has undergone many changes over time. One of the most drastic changes was the adaptation of separate panels for the sides and top as opposed to the old single U-shaped top. It is now time for the Twice7 to follow suit. All Twice7 cubes now employ the 3 panel design. More options for the Twice7 are also available. They are now available in Mirror Black, Sky White, or brushed aluminum. We now have solid panels, UV blue and green panels, as well as the original 3 window design available. Mountain Mods Bob Slay brings innovation, mobility, functionality and form to the masses. Mountain Mods unveils the U2-UFO Opti-1203. This version offers the same whopping 10 - 5.25 devices, 9 bay Hard Drive rack, and dual power supply options as the original Optimax units. The addition of a single 120mm intake allows for mounting a Thermochill HE 1203 radiator in a horizontal position underneath the 2 optical drive bays. Another new option is the availability of Acrylic panels in Ultra Violet Blue or Green. 07.01.05: A custom U2-UFO was used in CPU magazines July edition for the chassis in their Building the Ultimate PC article. 03.25.05: Mountain Mods was a proud sponsor of PDXLan 4.05. The tightly run and heavily sponsored event included talent shows, mod competitions, infinite soda, and 500 gamers competing for cool prizes. The Grand Prize was a compilation of over $6,000 worth of computer equipment housed in a Mountain Mods U2-UFO. 02.04.05: Mountain Mods has been given a website update. The new improved Mountain Mods vastly improves the user experience. Customers can now view the status of their orders as well as the history of their orders directly online. Multiple shipping addresses, posting and reading user reviews, and real time WORLD-WIDE shipping quotes increase the overall on-line shopping experience. 01.07.05: More changes have taken place to U2-UFO chassis. In short all U2-UFO's will now accept the Thermochill line of radiators without any modifications required and now support dual power supplies. More info HERE. 01.05.05: Mountain Mods Sponsored the Christmas giveaway at PimpRig.com this season. Lunamods put the custom paint to it and one lucky contestant went away with a treat. Photos in the the gallery HERE. 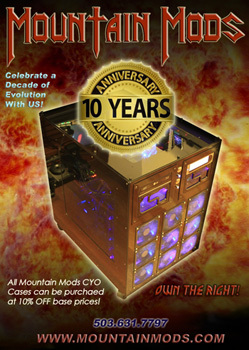 12.17.04: Mountain Mods is honored to have our U2-UFO computer case nominated as one of 2004's most innovative computer cases at Tom's Hardware. 12.01.04: Glitterkill of Pimprig.com has his Mountain Mods Custom U2-UFO featured in the new pc-modding book "PC Chop Shop Tricked Out Guide to PC Modding". Although we don't carry the book check it out. It has some great guides to PC-Modification as well as some nice photos of the U2-UFO Pimprig Limited Edition case. 11.25.04: A customer based photo gallery is now available for your viewing pleasure. Check out what others have been doing with their Mountain Mod cases. We encourage you to send in your photos if you have not done so already. Visit the Gallery. 11.04.04: Chill out with Father Time as he shows the world how to incorporate a Vapochill into a U2-UFO with style. Catch it Here. 11.03.04: Mountain Mods U2-UFO makes the front page of Tom's Hardware Guides Special Edition PC im Eigenbau. 11.02.04: Mountain Mods is taking customization to new heights. We now offer laser cutting and etching services to our customers. Currently we offer custom cut/etched windows, bay covers, blow-hole covers and 3.5 to 5.25 converters. Be on the look out for a plethora of items coupled with laser precision customization coming soon. 10.04.04: The U2-UFO (OPTIMAX) is released in Powder Coat Red, Black, and brushed aluminum with all Topshell designs available. This version incorporates 2 - 5.25 device bays allowing up to 10 devices to be installed. This was a popular custom request that we decided to make available as an option. The Evolution continues. 9.20.04: The U2-UFO SOLID TOP version can now be had in Patriot Red. 9.04.04: This is a revolution of the mind. Well OK - not really, but changes have taken place in our U2-UFO chassis. Become informed here - Do the Evolution. 8.26.04: Sprechen ze Deutsche? Siggy Moersch of Tom's Hardware shares with us his U2-UFO experience. Read his First Look. 8.23.04: Our friends in the UK over-clock.com have posted a PDF version of CustomPC Magazines article of Nathan Quick and the "Mountain Gear" (U2-UFO) that has made him quite popular. Check it out HERE. 8.08.04: Mountain Mods is a proud sponsor of the MSU IronMan LAN. The Grand Prize winner will take home one of our new Twice7 Cubes. 7.28.04: Twice7 is released. 14x14x14 in dimensions the Twice7 aluminum cube follows the U2-UFO in perfect cubical symmetry. It also utilizes the same dual chamber design. The left side housing the Motherboard Tray and the right side housing the drives and PSU. 2 chambers 7 inches wide or Twice7. Twice7 is constructed from the same industrial grade aluminum and 2mm thickness as the U2-UFO making it as stout as a brick. Its lightweight (10.5 lbs), its small size, the fact that it holds a mATX, ATX or EATX form factor motherboard, and its utilization of a full size ATX PSU make it a perfect power performance Mobile-LAN Platform. Twice7 - Twice Perfection. 7.25.04: The U2-UFO (1203) is released. This unit is Thermochill HE 120.3 ready. No cutting, drilling or tapping required. Available in Mirror Black with all Top shell designs. 7.14.04: Phoronix paints up a brushed aluminum U2-UFO. 7.10.04: The U2-UFO has received warm welcomes in the UK recently. Gary Mullins pimped out U2-UFO Pimprig LTD was featured in the June Edition of PC Extreme magazine. In July, Nathan Quick, owner of a Black U2-UFO won himself 1000 lbs of pc gear and an entry in Custom PC magazine. This entry earned him a spot in UK's first MODfest competition. Nathan, with his MountainMods U2-UFO in hand, took home 2 of 5 prizes given away at the competition including the "Best of Show award the case voted best by the visiting public". 3.28.04: MountainMods releases the U2-UFO (PimpRig Limited Edition) case. 3.27.04: In early January we were requested by Gary "GlitterKill" Mullins of PimpRig.com to build a custom U2-UFO for a project and review. We agreed to engage in the project and planned to release a U2-UFO PimpRig Limited Edition case based on his customization requests. See Glitterkills case and stompfest coverage HERE. 3.16.04: Xoxide.com has been reselling our U2-UFO as the X-UFO since September of 2003. 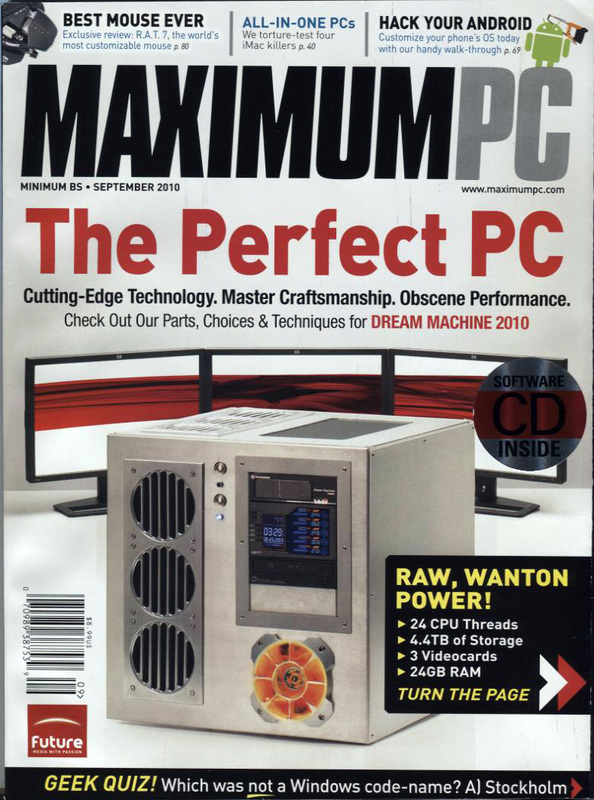 In March they sent a case into PC-Magazine for review. Result: the U2-UFO is awarded PC Magazines Editors Choice. 3.13.04: U2-UFO Spotted on Tom's Hardware covering of Stompfest action. 3.07.04: MountainMods releases the U2-UFO Solid Top in Mirror Black Powdercoat. 3.06.04: MountainMods supports StompFest LAN by giving away a U2-UFO. 2.10.04: MountainMods.com gets a major interFACE lift. 1.15.04: ModTheBox.com rates the U2-UFO best of 2003.